Simple super salad recipe inspired by Vietnamese food. 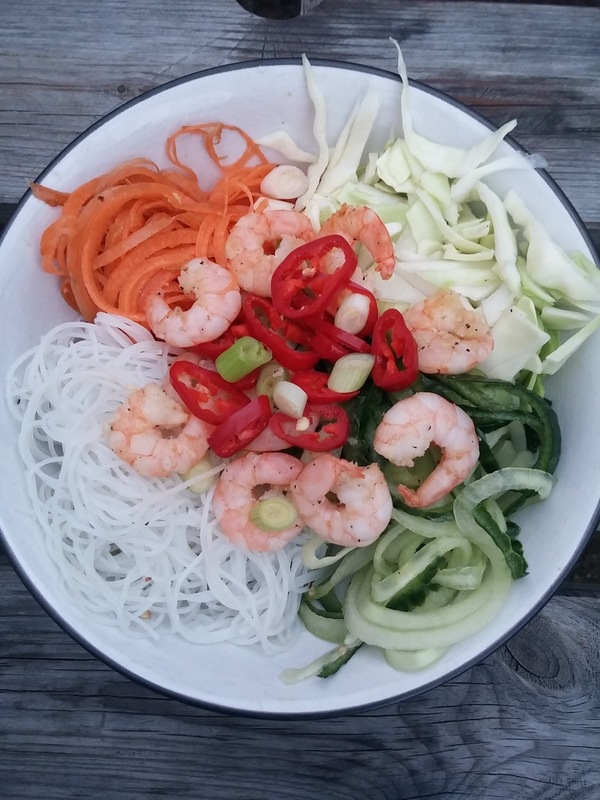 Cabbage, carrots, cucumber, chilli, king prawns, rice noodles and spring onions to warm your cockles. COCKLES. Salads are another reason to get a spiralizer - it's faster than grating and creates new interesting textures that jazz up the plate. We're more satisfied with different colours, textures and tastes on our plate. This dish is inspired by vietnamese salads and is cheap to make as well as incredibly easy. Admittedly it would be better finished with a lime wedge but I didn't have any in the house. This was a mish mash of stuff I had at home. I really don't want people to think I go shopping for speciality dishes all the time and eat like a queen all the time - convenience yourself! IMO it's all about being resourceful and creative: it's fun and challenging. The other day I had 4 rashers of bacon and two grilled peppers for dinner but obviously that's #offtheblog - I'm a normal person. Serves ONE - yeah baby feed yourself like you would feed a date! Small bunch of rice noodles - optional - if you're paleo you can leave this out and substitute with another veg serving. Bang all the salad in a bowl and make it look pretty. Boil the kettle while you're doing this. Mix half the fish sauce, vinegar and sesame oil with garlic and pour enough onto the prawns to marinade them - don't forget lots of seasoning. Mix the same again but without the garlic and reserve it. That's your dressing. Fry the prawns until cooked and at the same time drop your rice noodles into a pan of boiled water. The prawns will take about 3 minutes and the noodles the same. Drain the noodles and add to the salad. Dress and season the whole thing then top with the prawns, spring onion and as much fresh chilli as you can handle. Yum? Let me know how it goes if you make it!